Michael Dowling with the Northwell Health Labs team at the opening of a $47.7 million shared, centralized laboratory in Little Neck, Queens. 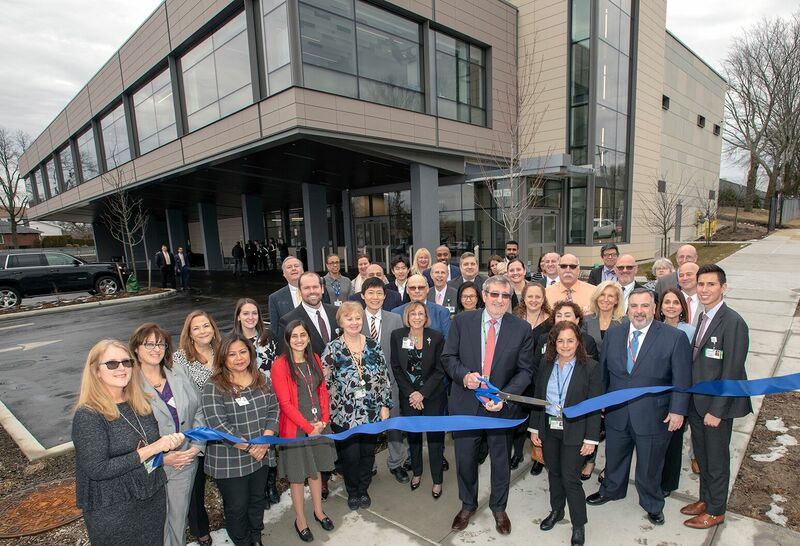 Northwell Health and NYC Health + Hospitals today celebrated the opening of a $47.7 million shared, centralized laboratory in Little Neck, Queens. The new Clinical Laboratory of New York – the largest nonprofit, hospital-operated lab in the nation – will enhance quality and patient services, while reducing costs for both health systems and their hospitals. The LEED Silver-certified centralized laboratory, located at 59-25 Little Neck Parkway, primarily performs microbiology tests, including molecular diagnostics, from local hospitals, clinics and physician offices, incorporating the latest technology and advanced robotic testing systems. The facility is administered by Northwell Health Labs, which performs more than 30 million tests each year between its Core Lab, hospitals, physicians’ offices, nursing homes and clinical trials, and handles more than 200,000 surgical pathology specimens annually. In addition, some six million non-urgent tests from NYC Health + Hospitals will be processed at the Clinical Laboratory of New York at Little Neck and Northwell’s Core Lab in Lake Success, enabling all public hospital laboratories to focus on urgent testing. The 36,000-square-foot, two-story lab is part of the Clinical Laboratory of New York (CLNY) Alliance formed in 2014 by Northwell and NYC Health + Hospitals to integrate laboratory services through a shared reference lab. The facility, which began operations earlier this month with 176 employees, will eventually grow to include 210. The lab’s opening represents the culmination of a years-long effort to standardize information systems and equipment and establish joint standards committees. Northwell made the upfront investment to build the Little Neck facility, which will provide enhanced service levels to physicians and patients in the community, while also bringing additional jobs to the city. The joint project is expected to save NYC Health + Hospitals more than $20 million annually. The Little Neck facility is one of two new facilities for CLNY, as later this month Northwell Labs moves its Core Lab operations from 10 Nevada Drive in Lake Success to the health system’s Center for Advanced Medicine at 450 Lakeville Road in Lake Success. The expansive $59.6 million, 101,000 square-foot facility has 84,000 square feet of clinical space, including the largest chemistry and hematology automated line of its kind in North America. The new Core Lab site includes laboratory medicine, anatomic pathology and administration. To handle additional volume generated by the new Little Neck and Lake Success labs, Northwell has hired about 90 new employees over the past year. In total, Northwell Health Labs has a workforce of more than 1,300.